Yoursay: Why is MO1 still trying to railroad KL-S’pore HSR? Anonymous: I wonder where former prime minister Najib Abdul Razak is getting his figures from. He says the Kuala Lumpur-Singapore High-Speed Rail (HSR) could bring in RM650 billion in gross national income (GNI) and create 442,000 jobs by 2069. He could just easily say GNI of RM650 trillion and 442 million jobs since he seems to be plucking random numbers from thin air. Once again, this is a man who lost Malaysia RM42 billion. Perhaps his ‘economic prowess’ is not needed anymore? Just a Malaysian: Najib, you have been mouthing statistics and numbers since you became prime minister. Remember the Economic Transformation Programme? And Pemandu? Poverty level figures? Just random numbers and figures, none verifiable. And nothing seems to come of it, except the rakyat suffering rising living costs, stagnant incomes, unemployment, and racial and religious strife. You refused to come to the ground to understand how we were suffering and mouthed impressive numbers from your ivory tower. So we got rid of you. And yet you continue to spout your unsubstantiated numbers. You are irrelevant to Malaysia now, just a tragic footnote in our country’s history. Please, be quiet and pray that our justice system can show you mercy for what you have done with our hard-earned money. Anonymous_e70407cb: Najib surrounded himself with self-serving, opportunistic ‘consultants’ who painted him rosy pictures of everything, finding numbers to make him seem like he was doing a great job. These yes-men contributed to his own defeat, and in turn, the fall of Umno. And yet, it seems like he still keeps them around. 0007379126933465376: How can you lay out a plan for the next generation when it comes to transportation? Approaching 2069, the 300km/h might seem slow, and commercial vehicles would have become electric or something else entirely. Wouldn’t the HSR be obsolete by then? And even if people still use it, why would it still continue to create jobs and bring in so much income 50 years from now? Quigonbond: Perhaps Umno is trying to find their angle in this ‘opposition’ responsibility by hyperbole as to how great Malaysia would have been if they stayed in power. Alas, it's more like trying to continue to pull wool over our eyes. The year 2069 is half a century from now! BN’s election manifesto said they would have brought in three million new jobs within five years – never mind if these are low-income jobs or other variants. How are 442,000 jobs in 50 years going to contribute to three million jobs in five? Pakatan Harapan need not use their own figures. Didn’t the BN government hire consultants for the project? Why would they be singing a different tune now with a different government in charge? All they’d have to do is show their projections to the Harapan government for re-evaluation. They do not need Najib to speak on their behalf. When BN becomes too desperate to show they can take our economy to the next level, guess which parameters and assumptions they are using? In the end, this hyperbole about profit of RM600 billion is as bad as plucking ringgit out of thin air. Eagle: So let’s see. The 350km track from Kuala Lumpur to Singapore will cost RM110 billion. The 355km from Shijiazhuang to Zhengzhou cost RM27 billion. How can our HSR cost four times more than China’s? 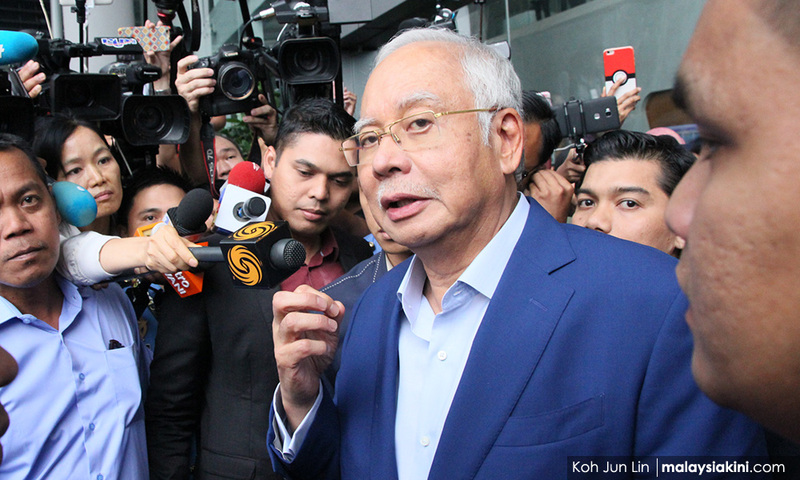 Beman: To be credible, Najib should tell us what benefits HSR would bring to Malaysia and Malaysians in 2029 or even 2039, when he would plausibly be still alive to be accountable for what he said. He chose 2069 instead because he knows he will be dead by then. And it’s so far into the future that the younger generation will not remember what he said. I’m so glad he got ousted on May 9. Or else, with his crack team of consultants, I’m not sure we could even make it to 2029 without going bankrupt. Appum: If Najib is so good at forecasting the future 50 years from now, how come he could not predict his own defeat? Maybe as a parliamentarian, you can debate this issue in the next coming session (if the Dewan Rakyat speaker thinks it's an important topic). By the way, your advisors probably have not read about the near future of things to come in 10 to 20 years’ time – let alone 50 – where many jobs of today will be obsolete and there will be a drastic paradigm shift in the nature of employment and skill type. Are you sure we need to take trains to Singapore so often in the year 2069? That’s not even considering the geopolitical scenario in 50 years. What matters to Malaysians now, especially those in the low-income group, is solving the economic problems in the here and now. Problems that you created. We don't need to spend billions on the HSR now and find out many years down the line it is a white elephant with no returns. Before we can talk about multiplier effects, we have to see manageable returns on investment first. Under your watch there were so many unnecessary mega projects, we wonder who they were implemented for? And more importantly, for whose benefit? AJ: I like your 'new economics', Najib. We know you have been practising it since your defence minister days or perhaps even earlier. Then, we needed submarines like we needed a hole in the head, but you saw the value and long-term benefit and convinced others to buy the unsinkable, out-of-date, vessels. You dug the biggest hole in the world with 1MDB and then dug several other holes, so the stuff taken out of smaller holes will eventually fill the hole you first dug, far in the future. Just face it, you were never a good politician, defence or finance minister. Where would you be with a different surname? You and your cronies took the meat and scattered bones for the rakyat. You brought the country to ruins not only financially, but morally too – you poisoned good people and pushed them to religious and racial extreme just to stay in power. But you’re out now. Good riddance.